It's time to get serious with sightseeing in Ethiopia. Everything we've heard and read raves about the "historical circuit", a loop that links Bahir Dar (on the edge of Lake Tana), Gondor (famous for 16th and 17th century castles and churches), Axum (centre of the ancient civilisation of Aksum, and most powerful city/state in Ethiopia for round a thousand years) and Lalibela (where King Lalibela had built a series of unique churches hewn directly from rock in the 1100s). We decide to tackle it clockwise, starting at the lake and finishing with the wonders of Lalibela. After the nightmare bus trip from Harar to Addis, we were suckers when a boy tried to sell us a 4WD trip from Addis up to Bahir Dar. It is a two day bus trip, compared to 9 hours in the car. No contest we say. We negotiated the price in the street, but to complete the transaction (ie, fork over some dosh) we needed to find the owner of the vehicle. Our boy took us on a route we hadn't yet walked, and wonderfully we found the elusive St George's cathedral on the way. It was a good km or so up a slight hill to meet Asafa, who seemed like a good bloke. We paid him for one fare, promising to pay the rest the next morning when we are collected - at between 4 and 4.30am!! 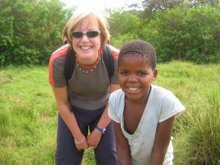 Our boy seemed to have become our semi-permanent companion, but he was useful to assist in the purchase of a skirt for me (thinking ahead to the conservative nature and heat of Sudan), and then we bought him lunch. We spent sometime in the (now rainy) afternoon back at the cathedral, which was being renovated prior to the millennium celebrations - they had better get cracking, there's a lot to do and it's only a few weeks - but we got to walk all round the inside, including into the usually sacrosanct Holy of Holies in the centre of the octagon. It was obviously not specially holy at this point. There was a museum alongside which was very interesting, and we were guided round in the company of Matt and James, who had just got off the plane from London. We all went for a drink and dinner together at the very posh Serenade, where the beers were 16 bir instead of 4! Still, this really was our last night in Addis. It absolutely tipped with rain overnight, and was still pouring at 4am as we sheltered in the verandah (last night's bedroom) waiting for our ride. We chucked our packs in the back and leapt into the front of a vehicle without much conversation at all, and it did occur to us to wonder if we were in the right car. Soon enough though we met up with Asafa again, for the money of course, and then were on our way. It was pitch black, pouring with rain, and also foggy and cloudy as we climbed out of Addis and headed north. 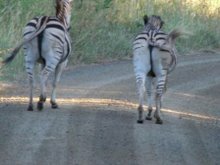 The drive was spectacular, and one of the reasons we left so early, apart from habit I assume, is that there were road works on the Blue Nile Gorge, and the traffic is reduced to one-way from 8am. We were through this incredible gorge just before then, and I was doubly glad we were in a 4WD, given both the weather and the road conditions. But it got worse. Just before Debre Markos, the road was washed away. Locals waded the route in front of the traffic to show where the road now lay, but in spite of this two trucks had fallen over. 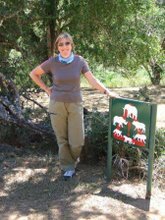 We took it slowly and got through fine, but were pleased to take a break at Debre Markos for coffee and eggs. It was a Sunday, and from mid-morning on we saw many, many people, white sharmas wrapped around their shoulders, walking to or from church. It was a lovely sight. The other strong visual impression was the many abandoned and rusted tanks on the side of the road. We were approaching Tigrai, the centre of the rebellion against the Derg, that culminated in its overthrow in 1991. We made Bahir Dar by 2pm and checked into the Ghion Hotel on the lakeside. Bahir Dar is Ethiopia's largest lake, and famous because of the large number of Orthodox monasteries on the lake's many islands, and as the source of the Blue Nile. Apparently most of the water in the Nile proper comes from the Blue Nile (Abay in Amharic), and I would say that the Egyptians are in for a fine old flood in due course, if the amount of water we've seen recently is anything to go by. The hotel organised a boat trip for us for the next morning, and we headed off in the company of Sheila and Thomas. Luckily it wasn't raining, and the lake was smooth and calm. There were fishermen in local papyrus reed boats called tankwa, which while they looked very picturesqe and eco-friendly, seemed to leave a bit to be desired in the watertightness department. 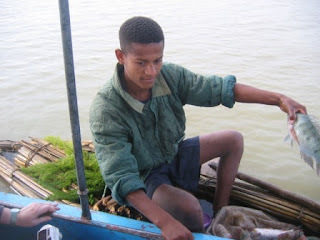 A less than waterproof papyrus tankwa, near the outlet of the Blue Nile on Lake Tana. One of the lovely old monasteries we visited on Zege Peninsular. We visited four monasteries in total, two on islands and two on the Zege peninsular. All quite similar, and all including small, round and very atmospheric churches, and photogenic monks. The classic Orthodox church in this part of the world is pretty much circular, with an overhanging roof, beneath which the faithful perambulate. The inside of the churches are divided into three circular chambers, with the outer one used for prayers and chanting, the middle one for communion, and the central one houses the Tabot - the replica of the Ark of the Covenant that every Ethiopian Orthodox church has. The walls are made of mud and straw, about 2 feet thick sometimes, and covered in cotton cloths which are painted. The paintings in one were virtually brand new, bright and sparkling, and in others were hundreds of years old, but still identical in style and substance - lots of saints, martyrs, legends and fables. We did learn that the baddies are always represented with one eye only (this included some sinful camels we noticed), which was useful to know when trying to interpret the stories. There were a couple of museums as well, containing a range of the fascinating and eclectic, and the plain humdrum. I must say that there are a lot of old books in this country, all beautifully written, illustrated and bound. We were then taken to view the outlet of the Abay, in spite of the fact that it was now pouring with rain again. Nice to see it though, and to realise that the next time we lay eyes on it, it will be where it meets the White Nile in Khartoum. 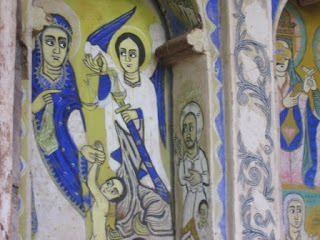 A sample of the beautiful paintings we were to see in churches and monasteries all over Ethiopia. Often the paintings are not as old as the church - when they fade or are damaged the monks simply paint a new one - but the style and subjects really add ambience to the buildings. 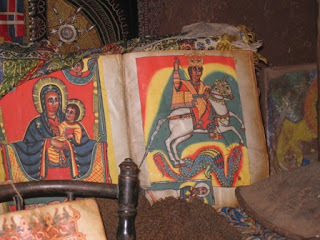 Here is Mary, and alongside her the ubiquitous St George, also the patron saint of Ethiopia, we discovered. One of the many beautifully illustrated old Bibles, all in Ge'ez, we were shown. They are often kept in battered leather satchels, or carefully wrapped in brocade cloths. Next stop on our itinerary is the old capital of Gondor (or Gonder or Gondar). It's only 185km north of Bahir Dar, and the local mini bus got us there in about three hours and was good enough to deliver us to the door of the Circle Hotel - which really is a circular high rise. Our room is a gem - sports on the TV, hot water and a balcony, and half the price of the Ghion. And it was sunny too. 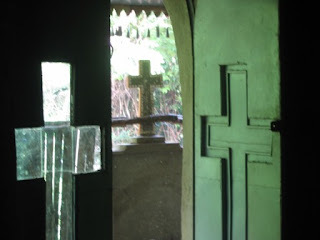 Today's outing was to the church of Debre Birhan Selassie - a 20 minute or so walk out of town. This church dated back to the mid 1600s, and was originally designed and built to house the Ark of the Covenant, which was to be moved from Axum. This never happened, but the church is based on Axumite architecture, and is the more conventional rectangular shape. It still has three chambers though, and the wide roof overhang as with the round churches. The paintings in this church were fantastic; 80 angels on the roof looking every which way, and some no holds barred images of the devil, and of Mohammed (one eyed) being led away on a camel. St George and the dragon are also very big in this part of the world, and he gleamed on a white horse in the gloomy light. After an abortive attempt at dinner at the Circle (there's no veal or chicken, or spaghetti or salad!! ), we eventually got pizza and mentally prepared ourselves for Gondor's highlight - the Royal Compound, a series of palaces and public buildings, mostly now in "ruins", except for Fasilidis's Palace which has been restored with UNESCO support. The site was fantastically situated, on the crest of a hill, looking out in most directions. Easy to defend I think. The ruins were very beautiful, and in the morning sun looked fantastic. 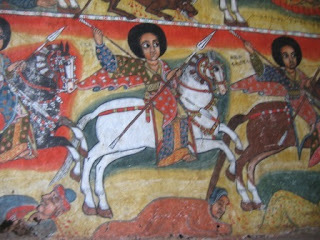 The work is mostly credited to King Fasil, and his palace has been done up a treat by the UN. It was heartening to see lots of local tourists here (it's school holidays, which accounts for the large number of irritating schoolboys that follow us about wherever we go). We spent an enjoyable few hours clambering around the ruins, and imagining life here a few hundred years back. The compound was enclosed by a large stone wall, so I guess, as always, real life happened much as always outside, probably not so differently to today. Our hotel is advertising a football match between Manchester United and AC Milan at 4, and we decided to watch it, as an antidote to all this culture. Unfortunately for us, they meant 4 local time, which is 10pm. We are on a bus to Shire tomorrow morning (en route to Axum) at 5.30, so will not be watching.